Media relations is the bread and butter of most PR agencies, and therefore cultivating and managing journalist contacts is key. But, what do you do when a media contact behaves in an unexpected or unprofessional way? Obviously, you want to maintain the relationship while maintaining professionalism. Here are a few recent examples of “reporters gone rogue” and how we turned the potential lemons into lemonade. When a media contact bypasses the agency. There are good reasons for clients to let their agency reps manage media strategy and handle initial journalist contact. We help prepare the client for an interview or interaction, keep everyone on the same page, and, yes, occasionally shield the client from awkward situations or even recommend against an interview when it’s not warranted. Above all, we may serve as negotiators for a mutually beneficial outcome, and media know that. But we’ve all had episodes where the journalist goes around us. In one case a writer was unhappy with a story embargo and contacted the client to complain. The client handled it by promptly turning it back over to us, which was absolutely correct. The lesson here is to make sure everyone knows the PR agency’s role and the reasons for it. When a reporter does an interview, then vanishes. This is probably the most frustrating media predicament a PR team can encounter. You’ve gone the extra mile to craft a relevant story pitch, determine the best reporter, make the case and have it all come together with a terrific interview. Then, nothing. We recently experienced this “media ghosting” with a major story for a technology client. It became embarrassing to report back to the client each week that we had no information, but we were polite and persistent in our follow-up. After a few months our persistence paid off big time, in the form of a great story. While no PR person wants to annoy a reporter or burn a relationship, we need and deserve to be kept in the loop. So we advise being courteous, but assertive. When a journalist won’t correct an error in a story. Hey, it happens. A reporter does a perfectly respectable job of covering your client’s story but trips up on a detail. It is a PR pro’s responsibility to reach out and ask for corrections. We aren’t talking here about misquotes (hard to prove if from a verbal interview) or the reporter that just hates your product but gives it an honest review. We mean errors – misspellings, wrong names, erroneous launch dates or incorrect background details. Most reporters will fix the problem in a timely way. Some, however, won’t. In our dealings with recalcitrant types, we’ve learned some tricks that help. Reach out as quickly as you can, communicate your request in a subject line if emailing to ensure the note is opened, and, of course, point out the error as politely as you can. Never “demand a retraction!” Have the correct information at the ready and follow up if you don’t get a response. When a story is scrubbed. Once in a while, your greatest media relations fear is realized. A journalist covers your story – new product announcement, key funding round, etc. – but it never runs. This can be the result of the editor deciding there just isn’t enough “there there” or other, bigger news taking precedence. Whatever the cause, the best recourse is to have managed client expectations early on. The media are under no obligation to publish everything they express interest in and once in a while a story is scrubbed. The good news? 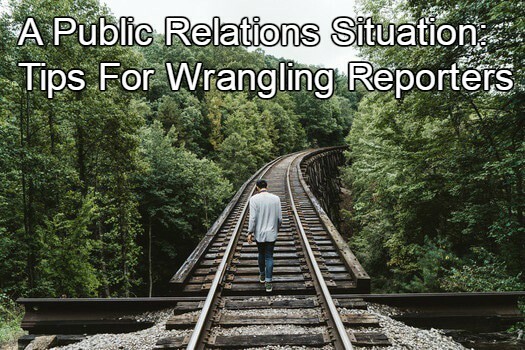 Often the reporter who bears the bad news will feel encouraged to be receptive to your next query and a good relationship can come out of the situation. When the story is great, but the headline isn’t. We once introduced a somewhat complicated new product feature for a tech client. A top publication wanted the exclusive and the reporter conducted an interview. Everything was perfect until we saw the misleading head. The reporter hadn’t really understood the concept so we thought if we provided some very clear explanations in a follow-up we might be able to get the title changed. In that case it worked. But that’s not always so. We were once told that a less-than-accurate headline for a B2B service story couldn’t be changed because the online pub had “set keywords we have to use in titles to grab readers.” We still say it’s always worth a try. I appreciate your tip to make sure everyone in a company understands the public relations agency’s role in business and ensure they act accordingly to make sure there aren’t any PR problems. I also like what you said about making sure the public relations agency always be courteous, but assertive. I’ll be sure to pass this article along to my friend who works for a public relations agency!